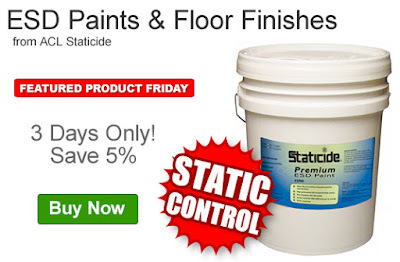 Save 5% off the Q Source price of ACL Staticide ESD Paints & Floor Paints. Our FPF052016 Coupon Code is auto applied when you add an ESD paint/finish to your shopping cart. Now’s the time to stock up on ESD floor paint/finishes for initial application or re-painting. This Featured Product Friday (FPF) promo is valid from today, May 20, 2016 through Sunday, May 22, 2016 and the code is unlimited use. ACL’s ESD paints and floor finishes provide reliable static control and safeguard floors in a variety of environments such as electronic, medical, cleanroom manufacturing facilities, and sensitive device manufacturing. For further questions about Featured Product Friday, please read our informational blog post, call us (800-966-6020), or send us an email. Please note: This promo is valid only at QSource.com and expires on May 22, 2016.